The Smith's whistling air filter. Homepage. This page: An optional engine air filter of the 1930s, with built-in audible warning. One of the pleasures of reading old car magazines, is studying advertisements and articles that promote the latest gizmos and gadgets, all designed to perform a useful role, and of course relieve the motorist of his or her hard-earned money. Some of these impressive-sounding gadgets were little more than gimmicks, whereas others addressed real-world issues, to assist the motor-owner in the maintenance and upkeep of his or her vehicle. Quite which camp the following whistling air filter falls into, I'm not sure, never having experienced one of these myself. In fact, until I read of this accessory today, I'd not heard of them ever. This Smith's product dates to the mid-1930s, at a time when many British cars - smaller models in particular - came with no air filtering device as standard. The carburettor simply ingested the air it was given, flies, dust and other foreign objects included. Larger-engined cars tended to be equipped with oil-bath filters, where a metal mesh was regularly doused with fresh engine oil, designed to capture airborne unwelcomes before they made it into the engine's internals. Oil-bath filters continued to be used throughout the 1950s, after which car manufacturers switched to throwaway elements in increasing numbers. A problem with air filters though, is knowing when they're fully blocked with detritus. A blocked filter can severely affect an engine's running characteristics, and also make it run an overly-rich mixture. A visual inspection of a replaceable element is quite straightforward to undertake. Assessing an oil-bath filter though is less easy, and certainly has the potential to be a lot more messy. 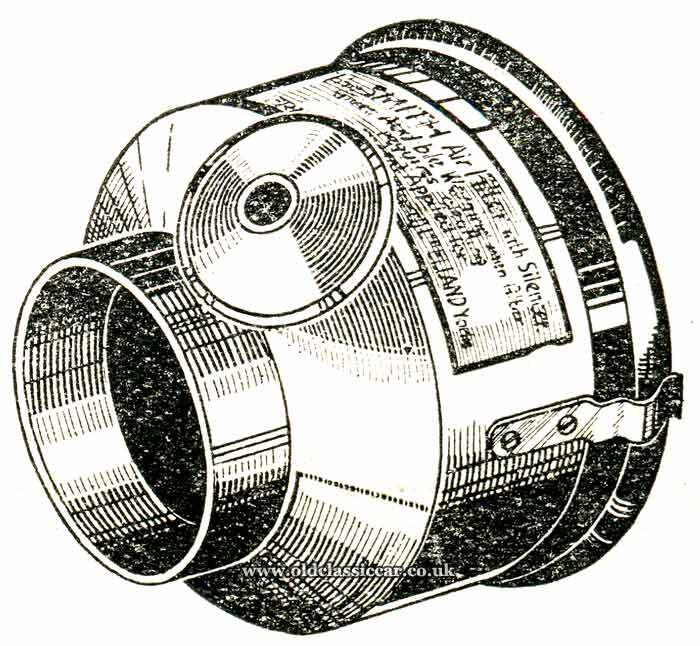 Hence the designers at well-known parts manufacturer Smith's, came up with this novel design of filter that incorporates an in-built, audible, warning device that let you know when the gauze filter needed cleaning and re-oiling. The filter itself was a mixture of fabric and wire, twisted together. It performed two functions, namely to perform the filtration, and also silence unwanted intake roar. As dirt was caught in the filter, so too did the filter's efficiency improve, until such time as it began to clog up and require cleaning. At this point, incoming air would be bypassed through a whistle, rather than the filter, giving the car's owner a clear indication that maintenance was due. How well it worked is anyone's guess - does anyone reading this have experience of such a whistling air filter? Versions of differing sizes were offered, to suit cars and also motorcycles. Given that an engine could easily be damaged by sucking in grit, a modest investment in such a device seems like a sensible option to me. I wonder if many of these air-filter-whistles were actually sold?